Butteries, top Hat, Rings, Hearts, Doves. Line 3 =text etc…. Line 2 = text. (1) Pewter 1 pint mug with verification marks for George V (GR 37 and L22) plus the word 'Pint'. Marked to base 'English Pewter, AW Gamage Ltd, London. TANKARD & DART SET. “BULLSEYE”. JIM BOWEN TV SHOW. LOTS OF LOVE. 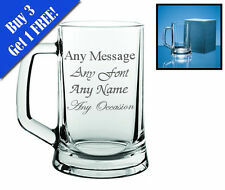 Personalised Engraved Abbey Glass Tankard With Gift Box - Any Message Engraved!! PALE ALE BOTTLE HAS ORIGINAL STICKERS AND STOPPER. LARGE TANKARD HAD FROG INSIDE. STARTING LOW! 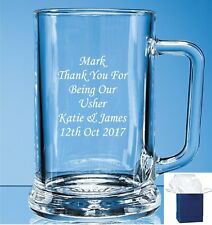 Personalised Glass Tankard. Tankard is 500cc 17 1/2 Oz in capacity. Engraved with any Design and Text for free. Sterling Silver Quart Tankard - Antique George IV (1825). 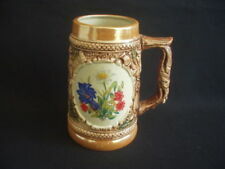 Super ceramic Spode tankard, perfect for a nice beer. Good overall clean condition, we have noted a small chip to the base. 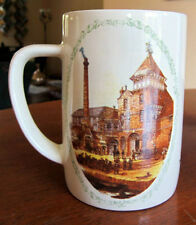 Tall glass tankard with Welsh Guards badge on one side and a picture of the Brandenburg Gate in Berlin on the other. Good condition no chips or cracks. 6 ins tall. Personalised for Any Occasion. Line 3 =text etc…. This is a 1 pint Georgian handle pewter tankard with a brass lip. 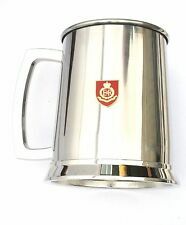 The body has straight sides with a curved Georgian style handle with a brass lip at the top and bottom of the tankard. 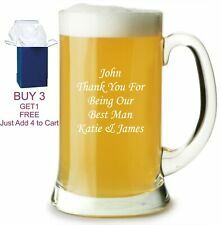 This thoughtful glass tankard can be expertly engraved with the words of your choice.Presented in a silver folding box, all you need to do is add the wrapping paper! 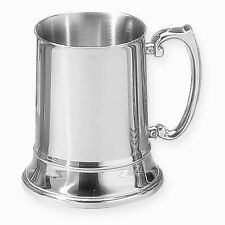 We can Engrave your Tankard with up to4 Lines of text and 20 Characters per line, Including spaces and punctuation. This item is a Large 24oz. Size Heavy Base Stern Glass Tankard. Personalised with up to 4 lines free. Ideal for any occasion.